What ever happened to Betty Crocker? Forget the birthday cake made from a box mix and the waxy primary colored candles of our youth. Imagine now an event that takes months of planning, countless hours combing Pinterest, Instagram and Etsy in search of the perfect themed event followed by countless hours executing said themed event. Lots of cash spent, the house wrecked, mom and dad needing to take to bed, and what’s to show for it? Pictures to prove to your child years down the road that you went insane one day a year? Parents, why do we fall into this trap? While I did not go completely insane, I did go bigger than I intended to for my oldest daughter’s first birthday party. Surprisingly, my husband was a terrible enabler. I set out initially to have a mini cake, made by me, with the grandparents over to watch the time-honored ritual of a one-year old smearing icing everywhere. And that would be that. Except that it wasn’t that. 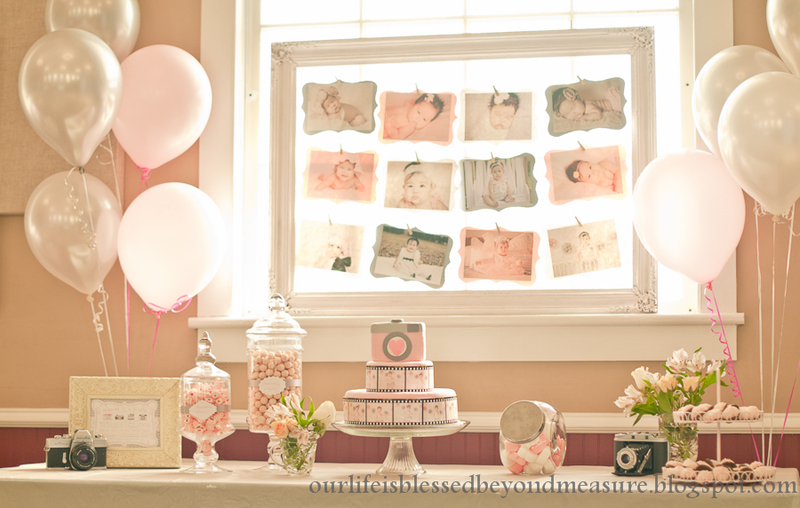 My husband really pushed for a big party, that it was our first child’s first, after all. I caved, allowing what should have been simple and stress free to turn into anything but. Extended family, friends, a buffet of homemade finger foods and treats, two dozen homemade cupcakes, not including the homemade smash cake, a helium tank purchased for the balloons, the perfect birthday girl outfit, monogrammed birthday bib, I could go on here, but you get the picture. And looking back, this party was low key and modest compared to other parties we’ve attended. Who’s to blame for this epidemic? Perhaps the blame lies with event planners in LA who celebrity moms hire to throw lavish parties for children with “quirky” names such as Apple, Blue Ivy, or Zuma. Maybe it’s MTV’s fault (remember MTV?!) for the strangely addictive, train wreck of a television show “My Super Sweet Sixteen”, where bratty teenage girls get their overindulgent parents to drop 10 grand on an over the top birthday extravaganza. Think red carpet and designer gowns, the hottest band of the moment, security guards at the door, all the while documenting how low we- as a society, have fallen. Or it could boil down to the fact that when you become a parent you are suddenly in a secret competition that your child is/has the best, and this competitive nature includes having the “best” birthday party. And biggest is best. Add gasoline to this fire, i.e. social media, and it’s the perfect storm for a one upper birthday bash blowout. (Or we could just stick with blaming celebrities and MTV). My youngest daughter’s first birthday is a few months away. Already the debate begins. I want cake and grandparents. Now my husband is using a different tact: Well, since we threw a big party for Emeline’s first, shouldn’t we throw a big one for Natalie, too? Sneaky. I’m a middle child and so of course this argument resonates with me. (Ah, but middle child angst stories are for another day…). Will I go insane this time around? Place your bets here. Do you go all out for your child/children’s birthday parties or did your own mother know best with her box mix birthday cake set atop a tinfoil covered piece of cardboard? 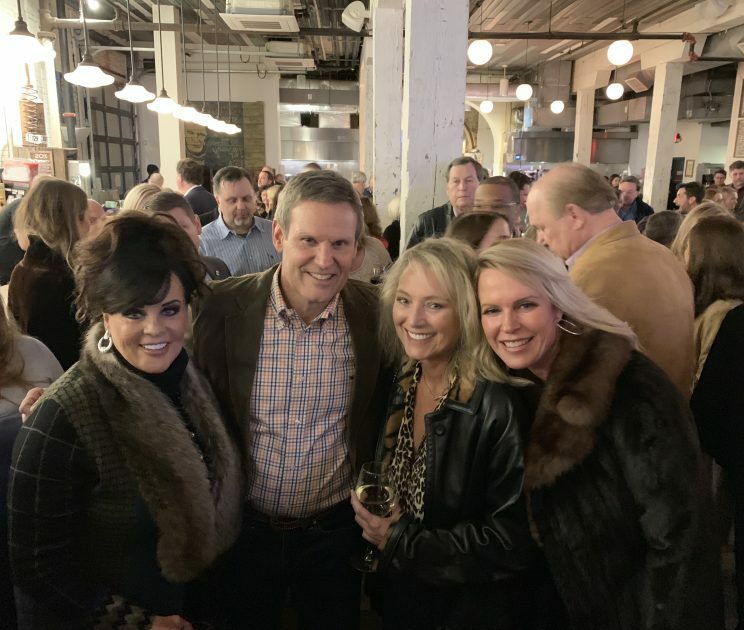 Pamela Garrett with the 50th Governor of Tennessee, Bill Lee, Dalena Berrett, and Dr. Cristy Stumb at Boots on Broadway - an event prior to inauguration at Acme Feed & Seed. 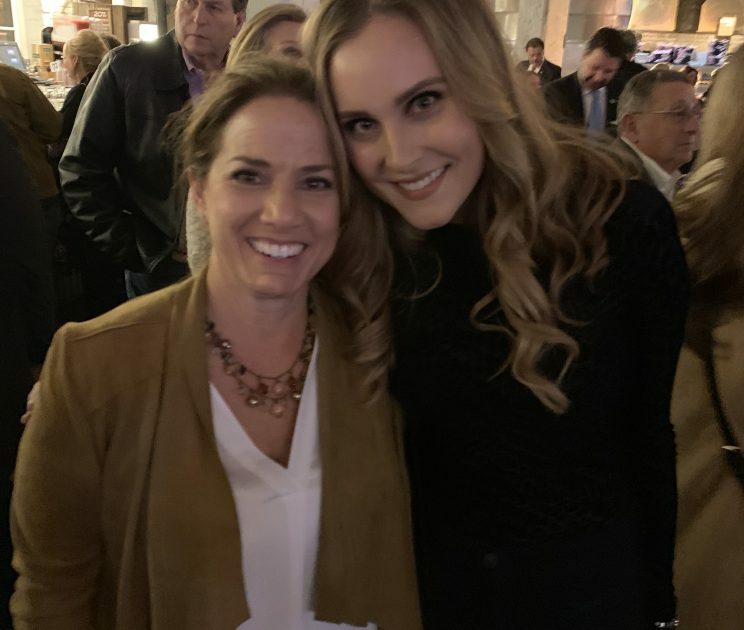 Jennifer Winfree and Ruth Franklin attended the Boots on Broadway event on Friday, Jan. 18, prior to the inauguration of Bill Lee. Yours truly with Tennessee’s First Lady Maria Lee at Boots on Broadway. 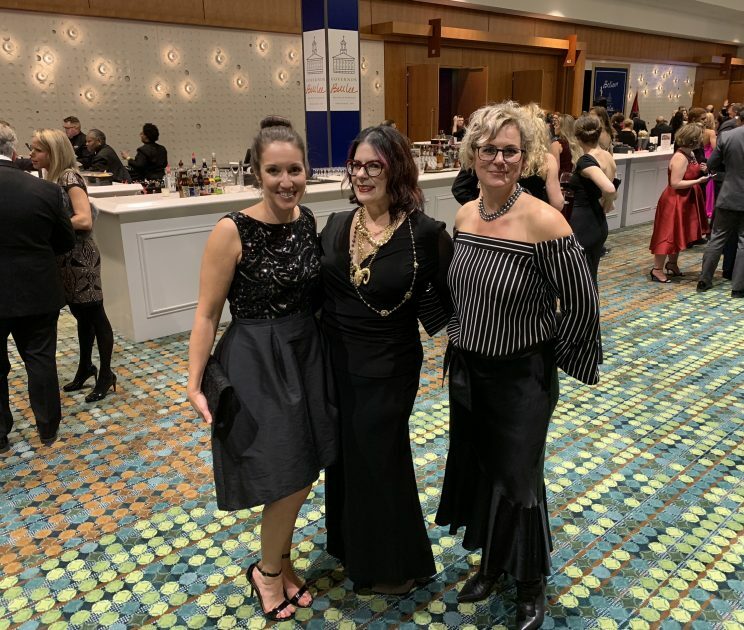 Jeni Lind Brinkman, Helene Cash and Heather Bay at the Believe in Tennessee Inaugural Ball. Rick and Necole Bell at the First Couple’s Inaugural Ball. 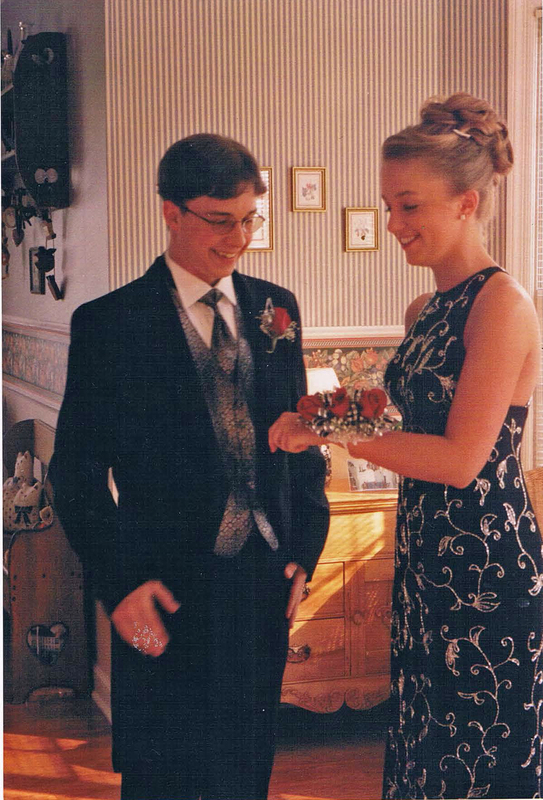 The event held a special meaning for the Bells - who met at the inaugural ball for Gov. Ned Ray McWherter 32 years ago. 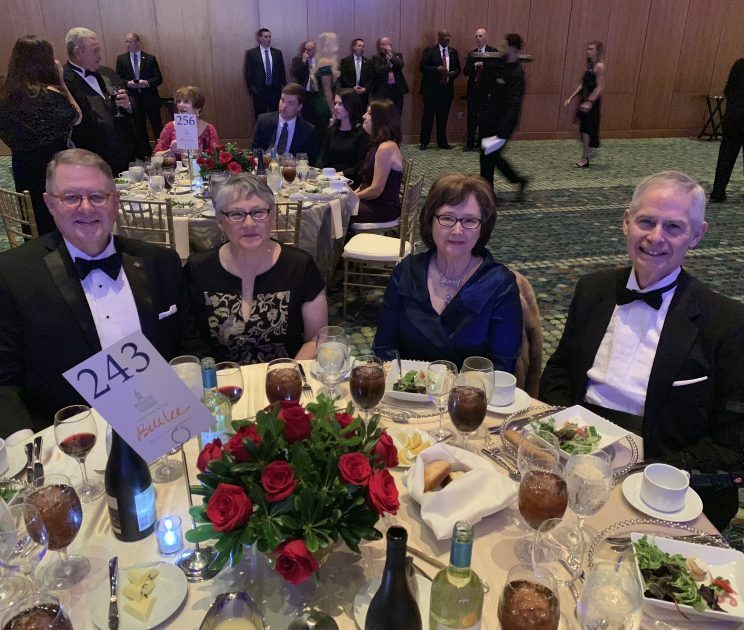 Jeff and Alice Gossage enjoyed sitting with friends Tom and Martha Boyd at the First Couple’s Inaugural Dinner and Ball held Saturday, Jan. 19 at the Music City Center. 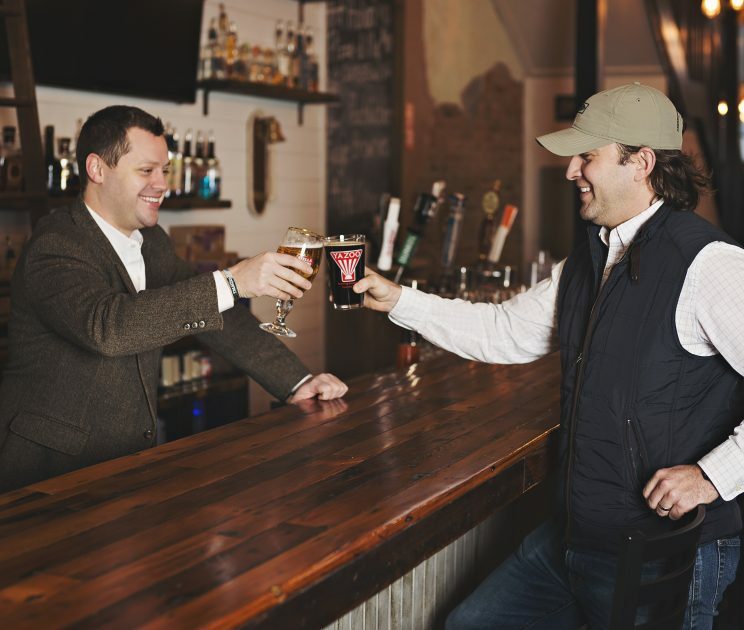 More than two years ago, businessman Bill Lee, founder of the Lee Company, em-barked on a new adventure. He would run as a republican candidate in the Aug. 2, 2018 gubernatorial primary. He knew the process wouldn’t be easy. He was an outsider to the political process – running against seasoned politicians from both parties. 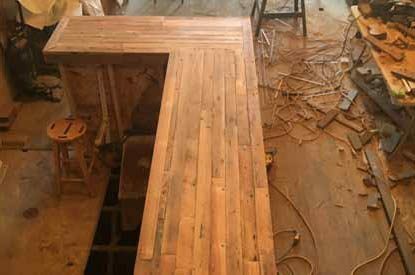 His company employs 1,200 skilled tradesmen al-ready, but Lee longed to make a difference on a larger scale. Lee and his wife, Maria, prayed about their decision for a year before he entered the race and were pleased when he won the Republican primary to face-off against Democratic candidate, former Nashville Mayor Karl Dean. The polls on November 6, 2018, showed Tennesseans had voted Lee to be their next governor – and on Satur-day, January 19, 2019, he was sworn in. Bill Lee is the 50th Governor of Tennessee. 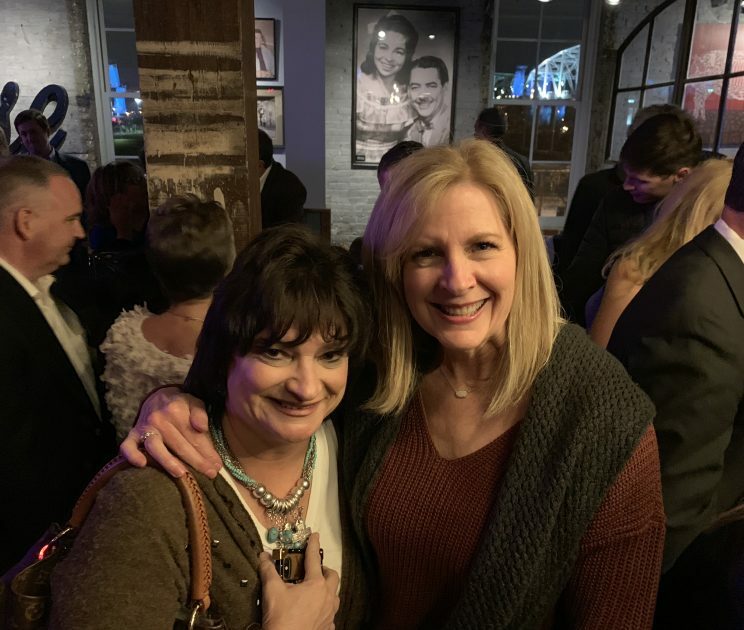 A series of celebrations were held over the weekend, beginning with a Boots on Broadway party at Acme Feed & Seed on Friday, January 18. An inaugural worship service kicked-off events on Saturday. The ceremony was held at Legislative Plaza, followed by a tour of the Tennessee State Capitol for supporters who signed-up. 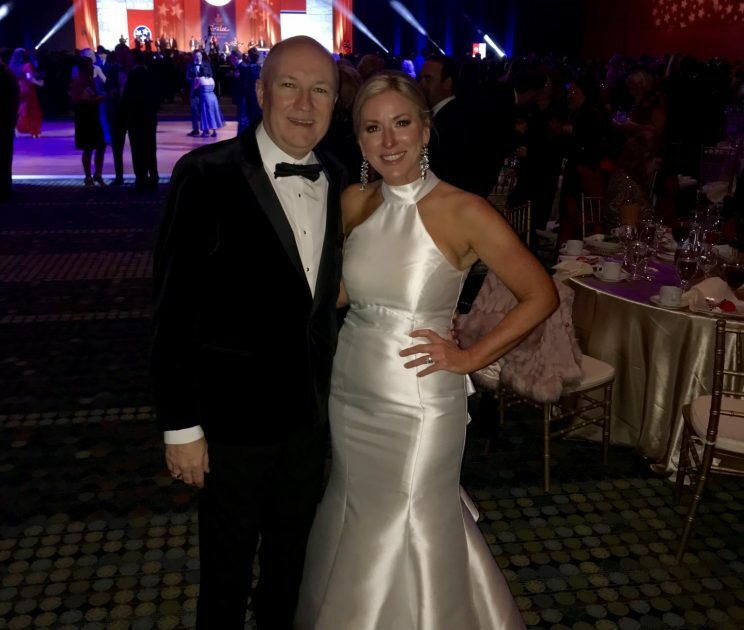 Two balls were held that evening at the Music City Center – the First Couple’s Dinner and Ball and the Believe in Tennessee Ball. Gov. Lee thanked the ticketholders in attendance. Lee next introduced special guests for the evening – which delighted the crowd at the Inaugural Ball. They were four-time CMA Entertainer of the Year, Luke Bryan, and outspoken country songstress, Wynonna. Bryan said it was an honor for a “kid from Georgia” to play the governor’s inaugural ball. He sang several of his hit songs and dedicated “Here’s to the Farmer” to the Lees as the couple had their first dance. Lee concluded by reiterating his commitment to his posi-tion. 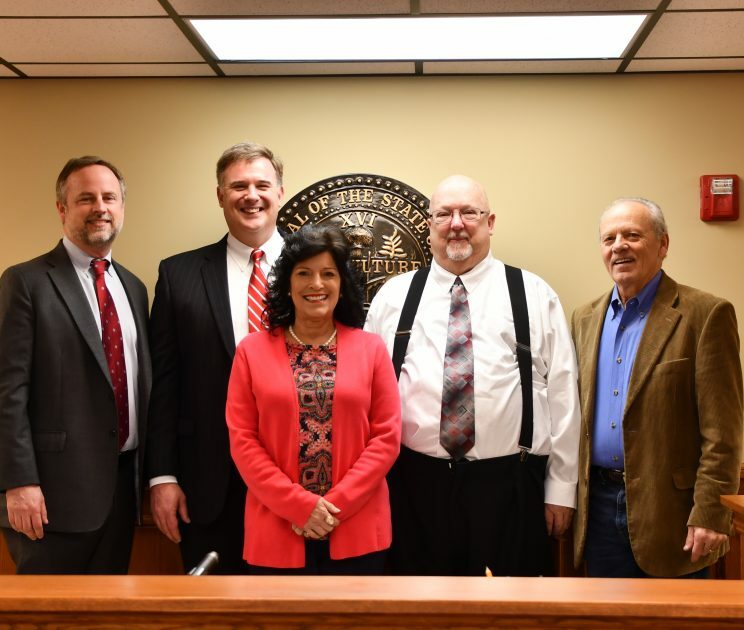 On December 31st, 2018, Ensley Hagan was sworn in as the new Wilson County General Sessions Judge, Division III following Judge John Gwin’s retirement. 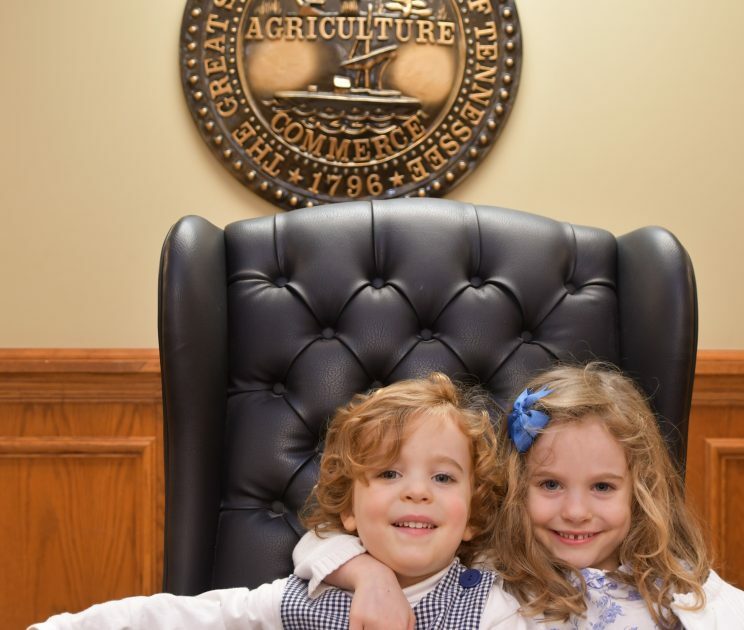 Family and friends gathered for the swearing-in, held the day before Judge Hagan’s official start date of January 1st. 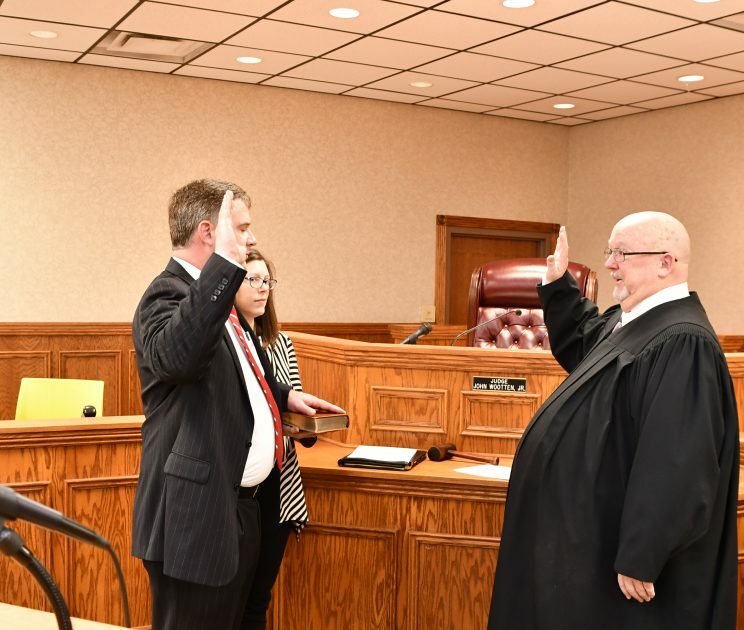 Judge Hagan began practicing law in 2007 with his father, Tony Hagan, and wife, Andrea. He is a third generation lawyer and a second generation judge. 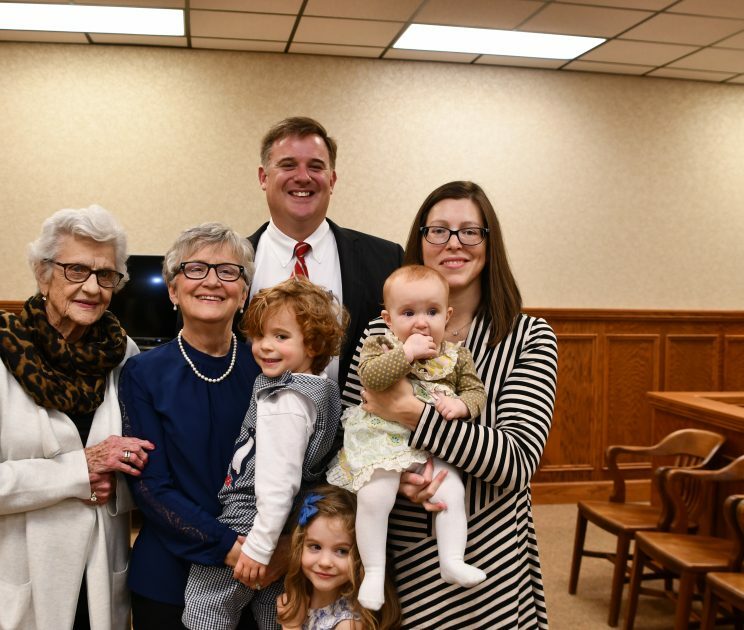 His grandmother, who was married to the late Judge Willard Ensley “Buck” Hagan was on hand to watch her grandson being sworn in. A native of Wilson County, Judge Hagan, and his wife live in Lebanon with their three children. As 2018 year comes to a close, many of us are starting to read up on new and innovative technologies available to us all in the new year. One such medical field that is at the frontier of present-day advancements is the ability to harness and enhance the body’s own innate response to heal and defend itself. To those that have experienced the miraculous power of what is known as regenerative medicine, they are true believers in this new therapy. Sounds impressive but confusing, right? In layman’s terms, it means our bodies were designed to heal themselves! Makes sense…you cut yourself, it heals. What would life be like if pain medication were not needed or surgical procedures were no longer necessary? By way of new technologies in the field of regenerative medicine, there are now treatments available to the general public that may enhance your own body’s natural ability to heal without the need for harmful drugs and surgeries. What seemed impossible only a few decades ago, is now not only possible but is our new reality. Regenerative medicine is a rapidly advancing area of health care that works to repair the injury, not just mask the pain. Unlike treatments that simply address the symptoms, regenerative cell therapy promotes the natural process of repair in the body assisting in restoring degenerated tissue. As we age our bodies degenerate due to cellular death. By taking cells recovered from completely healthy umbilical tissue, medical practitioners can now treat arthritis, alleviate chronic pain and even combat the natural effects of aging. The field holds the promise of re-engineering damaged tissues and organs by stimulating the body’s own repair mechanisms to functionally heal previously irreparable tissues or organs. At Inspire Medical & Wellness located in Mt. Juliet, owner and founder Dr. Jason Burchard, supervising physician Dr. Gary Adams and Zack Benner PA-C, are at the forefront of this emerging medical practice. As we know, umbilical cord blood is blood that remains in the placenta and in the attached umbilical cord after childbirth. This cord blood contains stem cells, which can be used to treat a number of disorders and has been for over two decades now. Inspire Medical & Wellness obtains their mesenchymal stem cells from the Wharton’s jelly inside the umbilical tissue from New Life, a multi-state and FDA approved cord bank that screens donors and extracts the cells from the umbilical cord. New Life is registered with the American Association of Tissue Banks (AATB). Therapies utilizing this umbilical tissue are countless – from regenerating damaged skin, accelerate healing and alleviating pain. 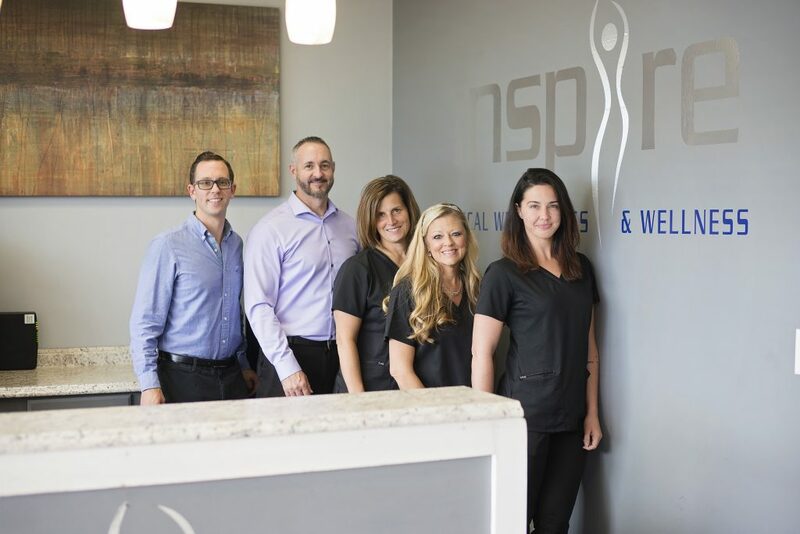 At Inspire Medical & Wellness, patients can find safe and effective treatments for knee, shoulders, hips, elbows, wrists and even neuropathy available without the harmful side-effects or pain. Their treatments can be used as a stand-alone therapy or in conjunction with other available medical treatments. Inspire also specializes in medical weight loss and bioidentical hormone replacement therapy. So, if you are tired of living with chronic pain, now is the time to take control! Contact Inspire Medical & Wellness today at 615-453-8999 and receive a complimentary consultation until December 15th and visit their website at www. weightlossmtjuliet.com for more information. The new year is almost upon us, isn’t it time you took that first step into a whole new and pain-free you! Inspire Medical & Wellness is located at 151 Adams Ln, Suite #18, Mt. Juliet, TN 37122. Stem cells are the basic building blocks of human tissue and have the ability to repair, rebuild, and rejuvenate tissues in the body. When a disease or injury strikes, stem cells respond to specific signals and set about to facilitate the healing process by stimulating your own body to repair itself. 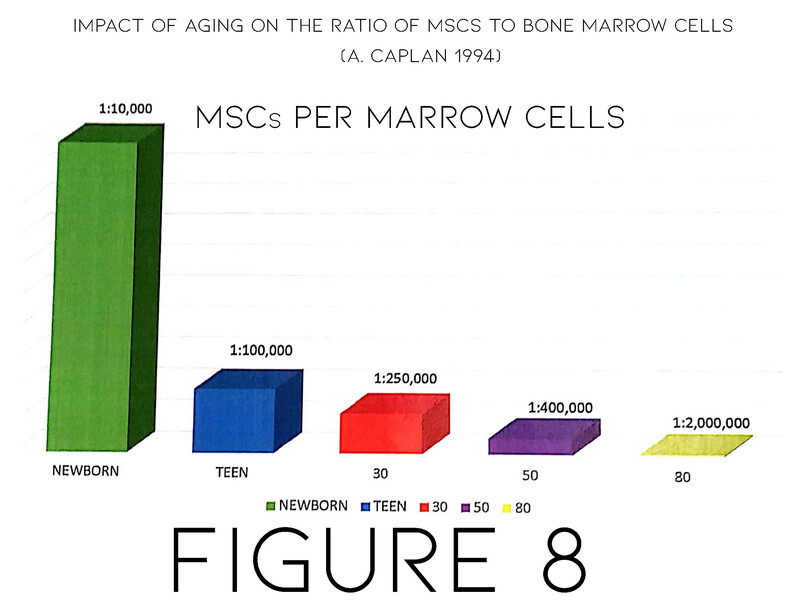 Stem cells that come from perinatal tissue(healthy post-natal C-sections) have distinct functional properties including immunomodulation and anti-inflammation which support the repair and regeneration of damaged tissue associated with disease and injury. When do we use the body’s stem cells? We tap into our body’s stem cell reserve daily to repair and replace damaged or diseased tissue. When the body’s reserve is limited and as it becomes depleted, the regenerative power of our body decreases and we succumb to disease and injury. 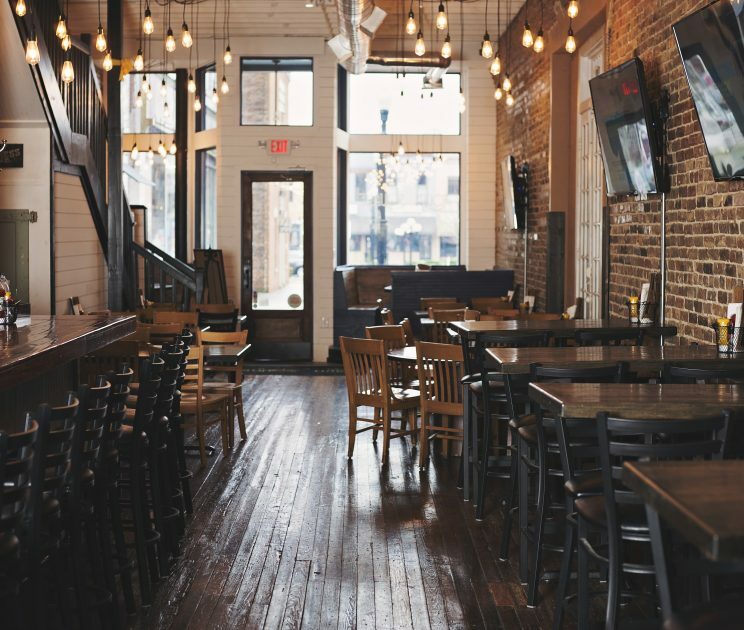 Wilson County is buzzing with new growth — economic and population — creating wonderful opportunities and experiences for its people, but with that growth has come an unintended consequence. As property values rise and rent payments go up, many families and individuals are having trouble finding or keeping affordable housing. In addition, as word spreads about the job creation happening in Middle Tennessee, people from all over the country have arrived on a search for opportunity, but without much of a plan. These factors, along with the inescapable difficulties of life, have left a small portion of our population without a home. L to R Front row: Dawn Bradford, Fairview Church and Coordinator; Michelle Wilde, Lebanon First United Methodist Church and Communications Coordinator; Joyce Gaines, Cook’s United Methodist Church and Financial Coordinator; Courtney Bradley, Chili Cook-off Coordinator; Lindsey Godby, New Tribe Church; Steve Wheeley, Salvation Army and Coordinator. L to R Back row: Jeff Loper, Providence UMC; Bill Owen, Leeville UMC; John Grant, College Hills Church of Christ and Executive Director. 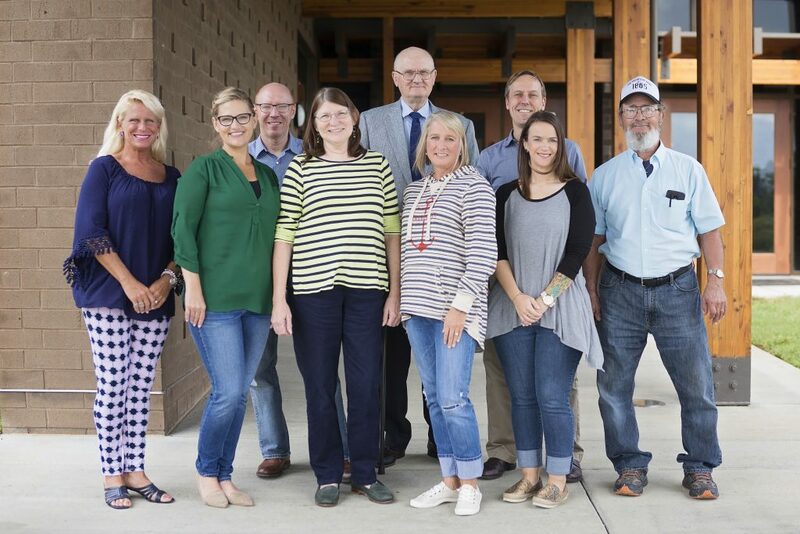 In our region, homelessness is assessed by the Homeless Advocacy for Rural Tennessee Continuum of Care, which is organized under the Department of Housing and Urban Development. Their most recent “point-intime” count found 25 homeless individuals in our county on a night in January 2018. 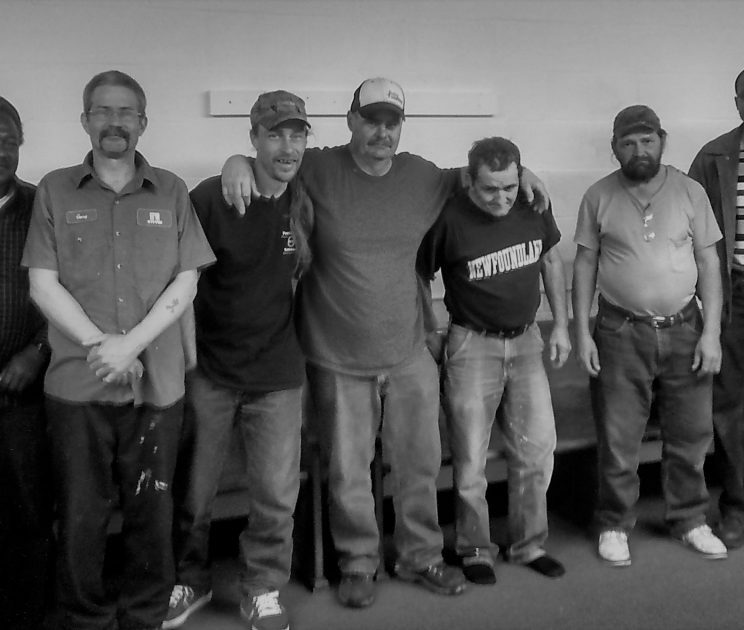 Compassionate Hands provides temporary shelter for men and women in Wilson County every night in the winter months. A large network of volunteers from churches of all sizes keeps the system running each night. Those in need of shelter arrive at Cross Style church for dinner each evening. After a short vetting process, these individuals are taken to three different host sites — two for the men and one for women. 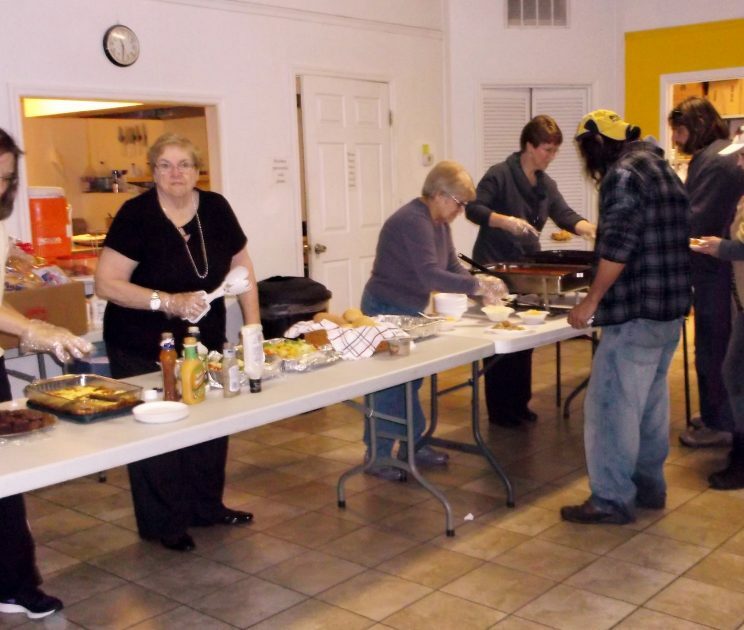 A rotating group of churches offer their facilities to house the men and women. The homeless are provided a safe and warm place to sleep, as well as a warm breakfast. Laundry service and the ability to take a shower are also available. In the morning, a bus takes the individuals to various places across the county and leaves them with a sack lunch. 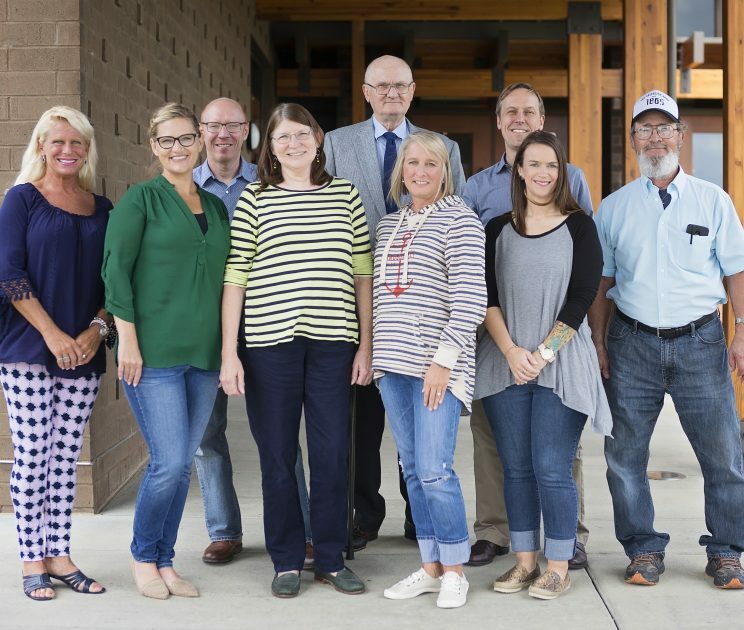 The coordination among so many churches and volunteers requires significant oversight and this October, John Grant, formerly a minister at College Hills Church of Christ, began serving as the full time minister and executive director of Compassionate Hands. Grant was a part of that original group who visited the homeless camp and began ministering to the homeless in 2013. He is the first full time staff member for Compassionate Hands. Though the decision to leave College Hills was a sad one for Grant, it was in many ways, an easy one, because of his desire to serve the community, his network of friends at churches and his personal giftings. “I think it was a call from God. This was a ‘John Grant’ shaped role,” he said. Grant is joined by a board of directors in leading the ministry, each from a different church in the area. They include Dawn Bradford from Fairview Church, Joyce Gaines from Cook’s United Methodist Church, Mark Taylor from The Glade, Michelle Wilde from First United Methodist Church in Lebanon, and Steve Wheeley of the Salvation Army. All of those involved in the ministry are quick to point out misconceptions about the homeless. They regularly and lovingly refer to them as their “homeless friends.” Many of those in need who have come to Compassionate Hands have full-time jobs and cars. Many are locals who grew up in our community and have fallen on hard times. Brandt Waggoner, lead pastor at Fairview Church, said their partnership with Compassionate Hands is important for their church. “These are people in need right in the middle of our community,” Waggoner said. “We cannot turn a blind eye to that. In addition, it’s remarkable how the churches across our area are seamlessly partnering together to serve this group. We want to be a part of that.” Dawn Bradford has served with the ministry for three years and says Compassionate Hands has “absolutely changed my life.” Bradford continues, “Yes, it’s inconvenient and sometimes a little uncomfortable, but it’s not about me, it’s about living out the biblical principle of thinking of others before your own needs.” John Ashman, a member of Faith Lutheran Church, is a volunteer with Compassionate Hands, along with his wife Bonnie. Their experience serving has made a profound impact on their lives. “Often when we see homeless people on the street, we may see them as lazy, dirty, and not worthy of respect. But when we sit by them during the evening or morning and talk with them about their lives, we see that they are usually people who have had a some bad breaks,” Ashman said. One of the most emotional moments for Ashman came last Christmas. “Due to the generosity of our church members, we were able to put together backpacks with a number of food items, personal care products and some warm hats and gloves,” Ashman said. “Church members wrapped the items, so that on Christmas morning, they were able to open the presents, just as if they were living with their families. One man said ‘It’s been a long time since anybody gave me a Christmas present.” Every year, the ministry has experienced growth. At the close of last winter, 34 churches from 16 faith traditions had contributed to Compassionate Hands, providing over 5,000 beds and 11,000 meals to 400 homeless individuals since 2013. “Every winter we’ve seen two or three people who go from homeless to established,” Grant said. 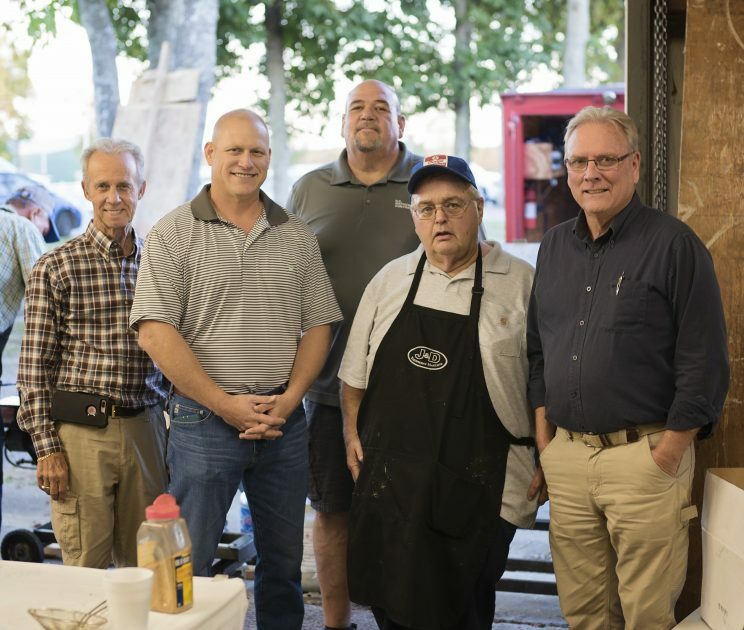 “They’ve gotten on their feet, into housing and are now volunteering in our ministry.” The leadership of Compassionate Hands desires to meet even more needs of the homeless. 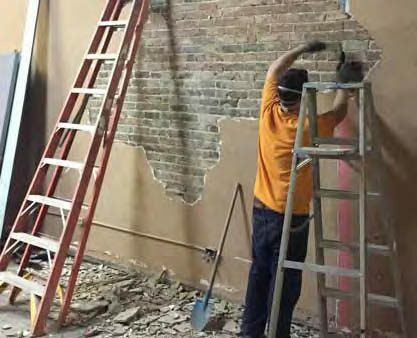 Their first objective is to secure an office space, but hope the years to come allow them to be able to provide shelter for families with children, as well as lockers, classroom space, and computer lab. For more information about Compassionate Hands or if you or your church would like to be involved, please visit compassionatehandstn.org, like their Facebook page or email John Grant at jgrant1817@gmail. com. But that move here also brought with it something else, something I wasn’t ready for. A Community. Most of my new friends had not only lived here their whole life, but their grandparents lived here too. Everyone knew everybody. They didn’t just have homes; they had a homestead. The people here seemed to have found the good life, and I was a little jealous. My parents moved to Virginia after I graduated High School, and when I started College at MTSU, I was ready to leave too. Only I couldn’t completely leave. I was still in love with that blond green-eyed hometown girl, and after six years Kimberly Carey had finally noticed me. We began dating our senior year, and even though I had moved to Murfreesboro, I made many trips back to Lebanon to be with her and her family. And even after attempting to move to Virginia to be with my parents and work in D.C., I was still in love with Kimberly, and I just couldn’t stay gone. We married in 2001, and her father built our first house one mile down from their home on Coles Ferry Pike. Kimberly and I wanted to move to a place where we could finally put down roots and create a place for our kids to return when they moved away. We almost moved to North Carolina, Oklahoma, and Memphis. But in 2016, I accepted the job as the minister for the UNA Church of Christ in Nashville, and we moved right back to Wilson County. Shortly after returning, we discovered that we didn’t need to put down roots nor did we have to make a home for ourselves. Our roots were already established. We were returning to the homestead. 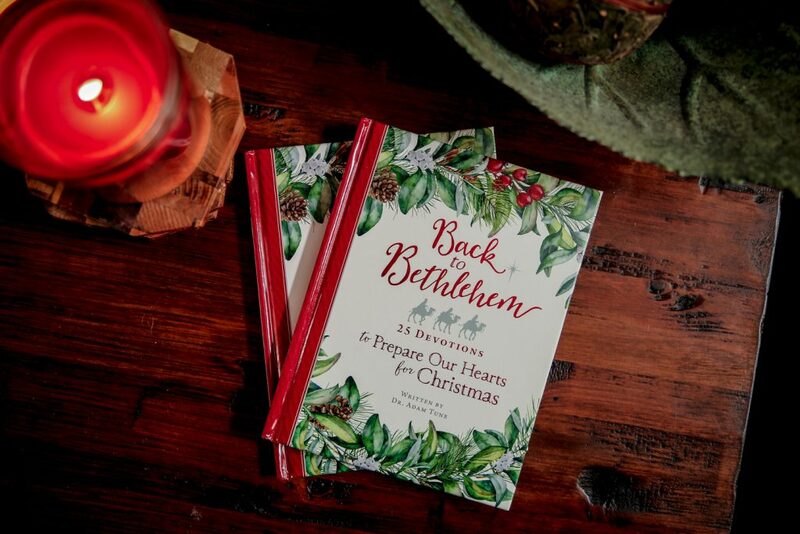 Upon our return to Lebanon, I began to feel nostalgic about my surroundings, and soon I wrote my first book—a 25-day Christmas Devotional that celebrates the memories of Holiday tradition and rejoices in the remembrance of the nativity story. It was published in September and released just in time for that season of the year where we celebrate faith, family, and friends. Back to Bethlehem, a 25-day Christmas Devotional, can be purchased through Amazon and locally at Square Market. 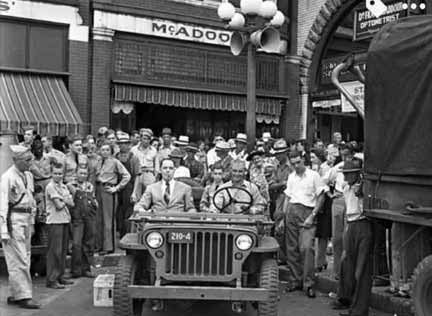 But if you are from Wilson County, you are already accustomed to this kind of celebration. Here faith, family and friends don’t just come together once a year. It happens every day. Here we know one another. Here we’re concerned for one another. When you have a community, you don’t have to search for the good life. You live it. You miss it when it’s gone. And you hold it tighter when you get it back. 2014 was a big year for Dr (Retired USAF Colonel) Paul and Elaine Nawiesniak. 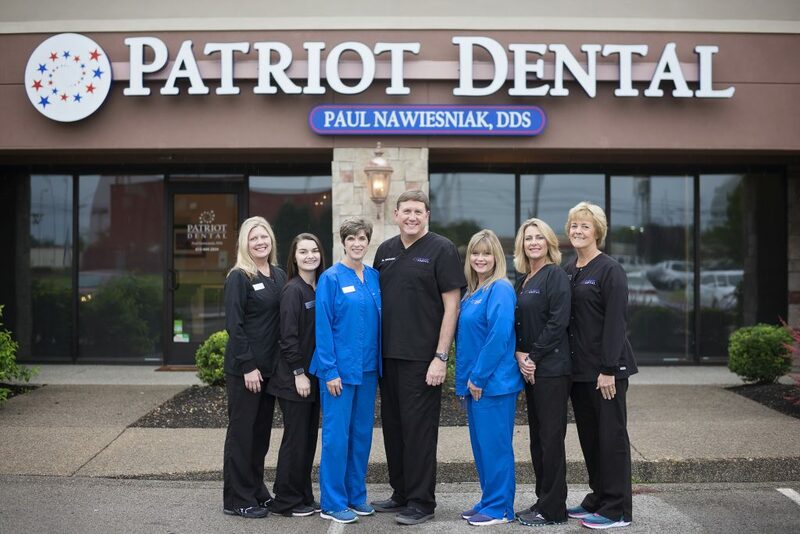 After an impressive military dental career that spanned nearly three decades and moves to eight different bases; including one in Japan, Dr. Nawiesniak decided it was time to retire and begin a new adventure right here in Wilson County. Patriot Dental (the name, an homage to Nawiesniak’s; military background) opened for business on June 14, 2014. His time in the Air Force gave Dr. Nawiesniak training and education that enables him to offer the best possible care to patients. He earned his undergrad in Biology from Loyola in Chicago and completed dental school at Northwestern University in Chicago. While in the Air Force Dr. Nawiesniak was selected to attend their two-year Advanced General Dentistry Residency Program. Upon finishing, he became certified with the American Board of General Dentistry. After more than 1200 hours of continuing education, Dr. Nawiesniak became a Fellow and then a Master of the Academy of General Dentistry. An impressive fete considering only 2% of all dentists carry this designation. 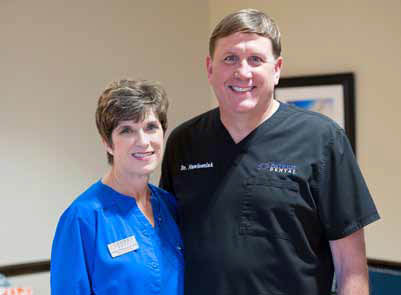 In fact, he is the only dentist in Wilson County who is certified by the American Board of General Dentistry. Dr. Nawiesniak works side by side with his wife of 27 years, Elaine. In addition to her duties as office manager, Elaine is a Registered Nurse and an accomplished photographer. 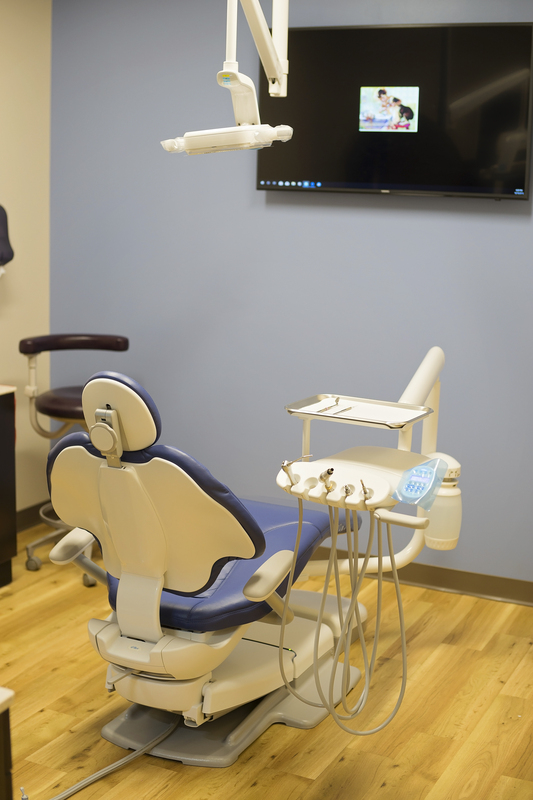 While Patriot Dental initially started out occupying the same space as Johnson Family Dentistry, as their patient list grew- thanks to word of mouth and the Nawiesniak’s community involvement- it was clear that they needed more room. “Our goal when we purchased the practice was to move to a new office within five years and we were able to do that ahead of schedule.” The Nawiesniak’s renovated an existing retail space located in Signature Place on the west side of Lebanon. As the dental industry continues to evolve, along with technology and advanced education, Dr. Nawiesniak says patient focus is essential now more than ever. “Our goal is to meet patient’s where they are in their dental needs and work with them to achieve the best possible outcomes for their oral health.” Dr. Nawiesniak continues, “We recognize that not everyone has always had access to dental care and may be embarrassed to seek care. We find helping these patients to be particularly rewarding. To help those who don’t have dental benefits we offer an in-house discount plan that is focused on preventative care which we emphasize in our office”. Our front desk receptionist, Beth Williams, has lived in Lebanon her entire life. She always has a smile on her face and has the best laugh! She has over 20 years’ experience in dealing with the always challenging insurance issues that arise daily and is an amazing multi-tasker! She does her best to help our patients manage their benefits to their maximum. She keeps everyone humming along. We affectionately refer to as our Queen “B”. Our lead hygienist, Jace Crooks, is the perfect fit for our office. 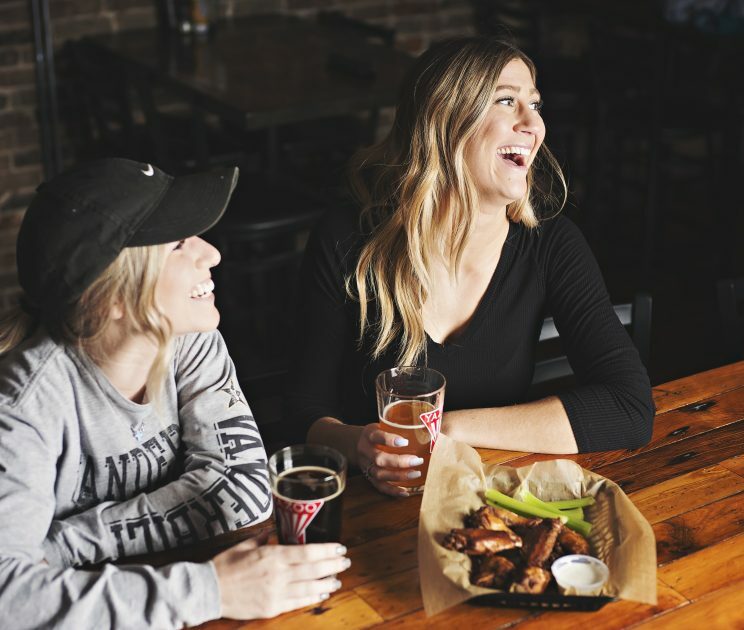 She is originally from Minot ND which was one of Dr. Nawiesniak’s prior duty stations in the Air Force, so he bonded with her instantly over stories of life in freezing weather, ice fishing and her fun North Dakota expressions. She received her hygiene training at Tennessee State University and has been a hygienist for 15 years. 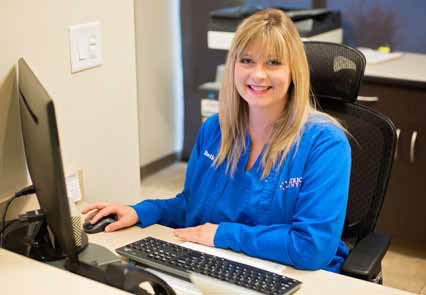 Her attention to detail and genuine care for our patients make her an asset to our office. 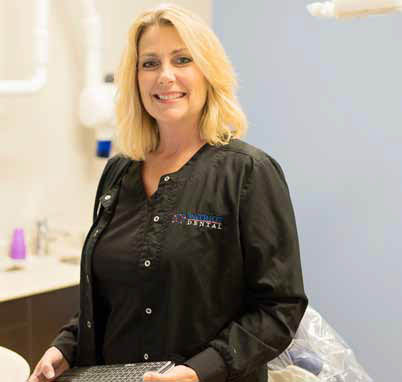 Our other hygienist, Debbie Page, came to us searching for a privately-owned dental practice to work part-time in after she and her husband Mark moved to Lebanon from Ohio. She brings over 20 years of experience. Both of our hygienists have helped us grow our practice thru education that emphasizes preventive care. Our lead assistant, Andrea Griffin, received her training at Nashville Staff and is an expanded duties assistant with over 20 years of experience. Andrea has a talent for making patients feel comfortable. She and her husband Mark live in Antioch and are planning to eventually relocate to Lebanon. She loves music, craft beer, and fishing. She’s also a die-hard Alabama fan but don’t hold that against her! Our newest team member is assistant Miranda Walker. Miranda is from Lebanon and is a graduate of Vol State University. She and her husband just purchased their first new house in Hartsville. We call her the Swiss Army Knife of our office. She does whatever needs doing in our office and always with a servant’s heart. Dr. Nawiesniak›s wife, Elaine, is our office manager and marketing director. Elaine is originally from Louisiana and is an emergency room trained RN. 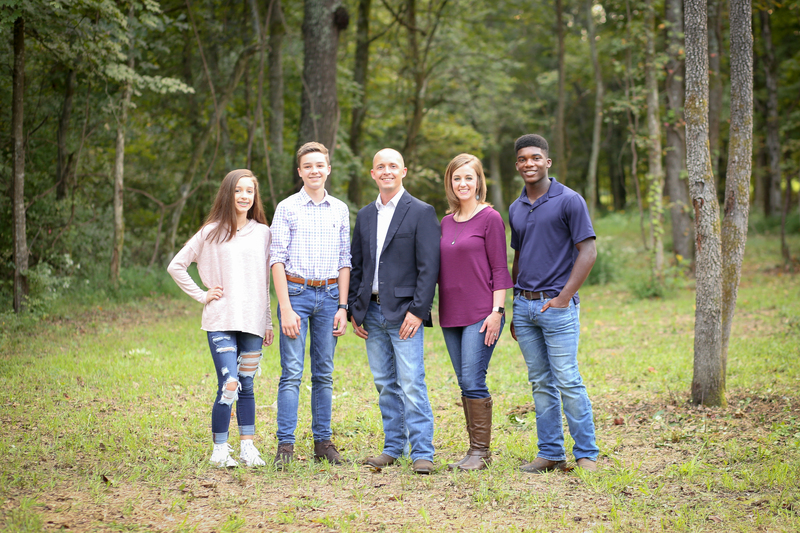 Her military spouse philosophy has always been to «Bloom Where You are Planted» and she has done her best to embrace Wilson County as our forever home. She is a member of the Lebanon Noon Rotary Club where she serves as Sergeant at Arms, she is on the membership committee for the Lebanon Wilson Chamber of Commerce and is the Treasurer for Wilson One, a local woman›s networking group that focuses on community service. She is a graduate of Leadership Wilson Class of 2018. 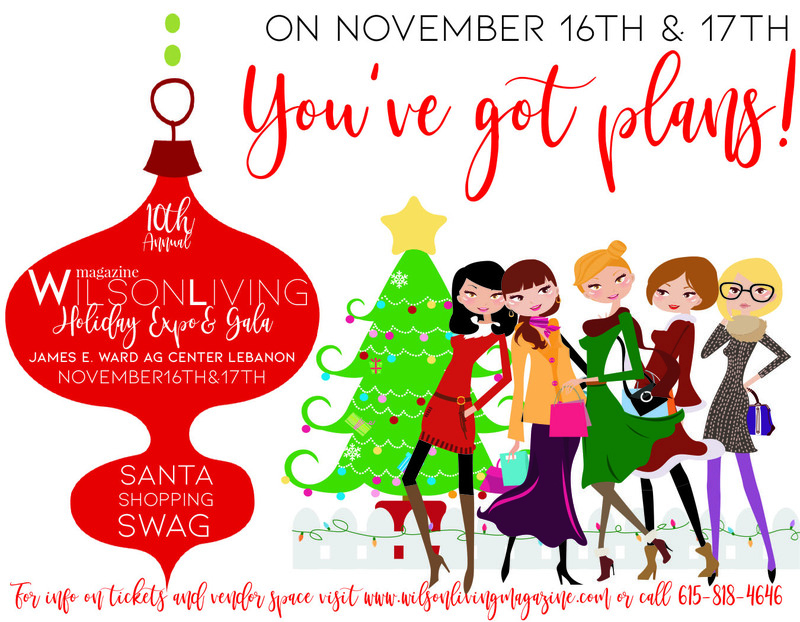 10th Annual Wilson Living Holiday Expo! If you haven’t noticed the holidays are here! And we couldn’t be more excited as Christmas is our favorite time of year. To celebrate all things Christmas, 10 years ago we started the Wilson Living Holiday Expo and are excited to be bringing you a bigger, brighter and better Holiday Expo than in year’s past. The doors open bright and early on Friday and will stay open until 4 p.m. for the general public. This year we have included more booth space and will have three buildings filled to the brim, as well as various outdoor vendors on hand. Vendors were hand selected for their unique products, and to encourage more local participation we allowed vendors to share space this year, to bring in even more selection. That means there is something for everyone on your holiday shopping list including gifts, clothing, jewelry, holiday decor, art, as well as tasty treats and warm drinks. On Friday the Expo doors will close at 4 p.m. and reopen at 5:00 p.m. to 8:00 p.m. for the Holiday GALA party. Different tickets are needed to attend the GALA. 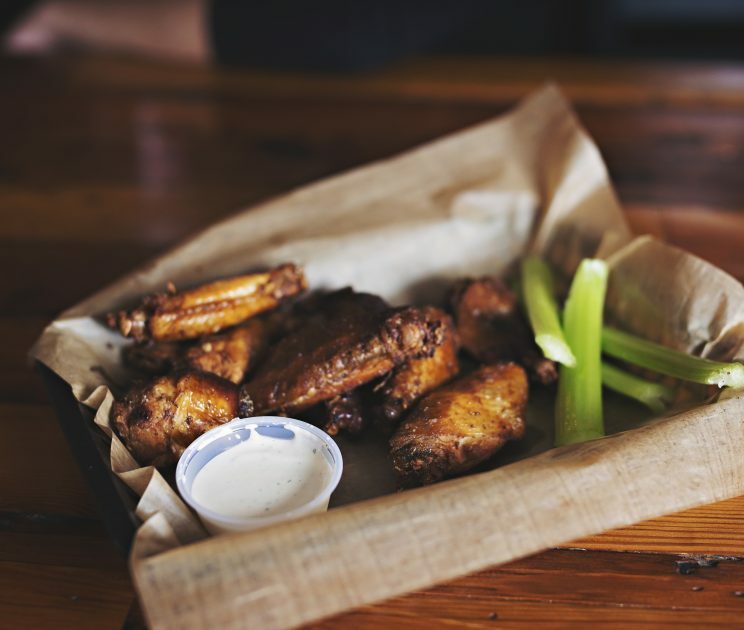 Once inside our ticketed guests will be treated to tasty treats and drinks courtesy of Sammy B’s, swag bags filled with great free products and exclusive vendor discounts just for our special guests. Santa will be on hand for free photos as well. It’s a night of holiday music, twinkling lights and shopping galore – so be sure to bring a few friends and kick off the holidays at the best holiday party of the year! On Saturday we reopen our doors at 10 a.m. and will again stay open until 4 p.m. Friday or Saturday General Admission Tickets, as well as GALA tickets, can be purchased online on our website at www.wilsonlivingmagazine.com, on the Wilson Living Magazine Facebook page, at various Wilson Bank & Trust locations, as well as at the door. $1.00 of every ticket sale will go to the Agricultural Center Management Fund. On Saturday, Mrs. Claus will be on hand for free photos with the children and various book readings. We also will have various local authors on hand for book signings. The great thing about the Fairgrounds is all the space! If you are a local vendor and want to participate, give us a call at 615-818-4646 or 615-364-9082 or email us at info@wilsonlivingmagazine.com. We want to have as many booths as possible for all those attending so don’t delay! We have been blessed with continued support, not just from the community, but from our Sponsors over the years. Once again this year, Wilson Bank & Trust, Tri-Star Summit Medical Center, Vein Centre, The Lett Center, WANT, Advanced Signs and Sammy B’s, are sponsors. We appreciate their support and what they all do for this community. Save the dates! November 16 & 17 & SEE You aLL Soon!! If you haven’t been before, this is the year to come out. If you have been before, then come back to see all the returning vendors you love plus many, many new ones. It’s ten years in the making and we can’t wait to see you all very soon! Chuck Keel said he didn’t get to Fellowship House in Lebanon by accident. This respite and place of redemption helps addicts get on the straight and narrow, and, it keeps its residents accountable. Keel is the director of operations of Fellowship House now. Ten years ago, beer took away his spirit. Four failed marriages and dozens of jobs had gone bad. Keel was a train wreck in the worst degree. “I had gone as far as I could go,” he said. “I could not pay the rent. I was not working. I loved the beer better than jobs and four wives.” He said he had 15 seconds of a lapse in judgement and swallowed a handful of pills to end his misery. But, he had a epiphany two seconds afterward, and called 911 to save his own life. From that day forth he never had a drink again. It was the ultimate “hit bottom” moment. And now he runs the house – and who better to uplift and steer-straight addicts than a reformed addict who has been down that road and can support and uplift? He’s been there and done that. 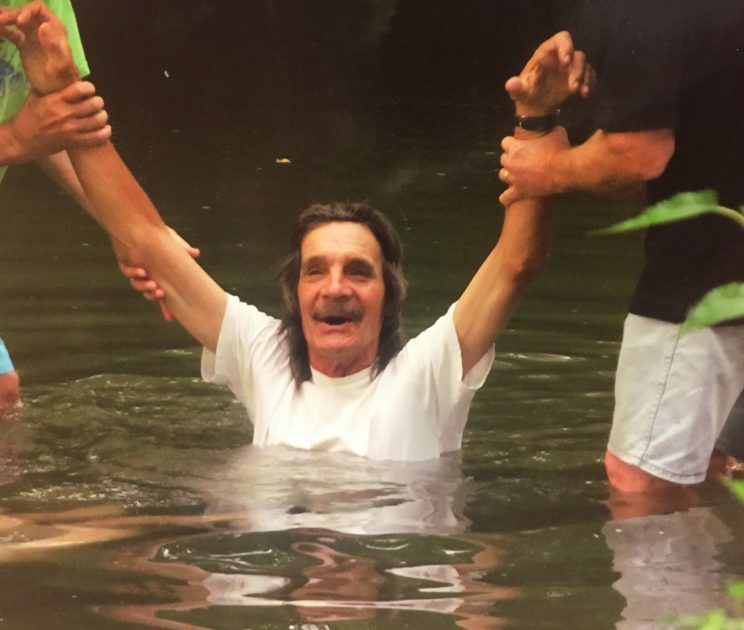 The near-death experience made him sober, but, he remained sober with the help of Fellowship House. “I became involved in their daily Bible study and that is what kept me on track,” he said. Now, Keel mentors Fellowship House clients in his role at the house. He helps men from the abyss of addiction and guides, restores and supports them so they can live full lives; free from alcohol and drugs. Currently, there are more than a half-dozen men in residence. Lebanon attorney Gloria Jean Evins is very aware of Fellowship House. Her husband, the late Eddie Evins of Cracker Barrel fame, was instrumental in the start of Fellowship House. On April 24, 1992, the College Street Fellowship House was turned into a 501c. Since that time, Fellowship House has been used as a “half-way house” for those in recovery from addictions to alcohol and other drugs. Today, modest rent is charged to those who come to live just out of treatment or jail. They have access to a kitchen, living room, shower and their own bed. They are required to attend daily recovery meetings, stay clean and sober and get a job. They also must agree to random drug tests. There’s a curfew. 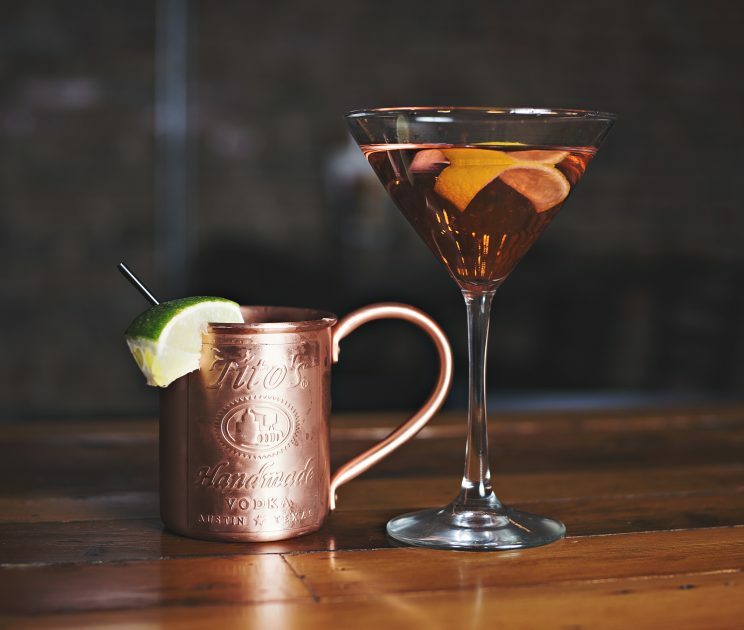 Though not officially connected to Alcoholics Anonymous, Fellowship House hosts daily meetings at their place and these are mandatory for their residents. David Denney is the current Fellowship House chairman of the board. He got sober in 1984. “I got into trouble,” he explained. He had three DUI’s and one ended in a vehicle homicide. He knew that was his ultimate bottom. Now, he nurtures Fellowship House residents, and, is a role model of sobriety. Fellowship House holds 22 meetings each week and there is a daily Bible Study in the morning. An important component is “Chicken Church” on Sunday that starts at 10:30 a.m. During church, residents learn lessons about living life on life’s terms. Denny said Fellowship House has a good history of reforming residents. Larry Garner, 62, is a current resident at Fellowship House. He had a good living as an electrician. In 2009, he had a work accident and his ribs and collarbone and back were hurt. “They put me on pain meds,” he said. In 2010, he had an automobile accident and broke both legs. It was a disaster in the making. He was put on disability and was addicted to drugs. “But, my primary drug was alcohol,” he said. He had three DUI’s in some months. Spent time in jail. His driver’s license was taken away. “I was depressed and angry and full of self-pity,” he said. One day he went to an AA meeting and saw a guy without legs, and another guy with cancer, and another guy blind. “I realized how blessed I was,” he said. He said Fellowship House has helped him believe how blessed he is. He is now working, and, working out. “I’m building a bridge,” said Garner. Denney said it’s these transformation that solidify the work at Fellowship House. 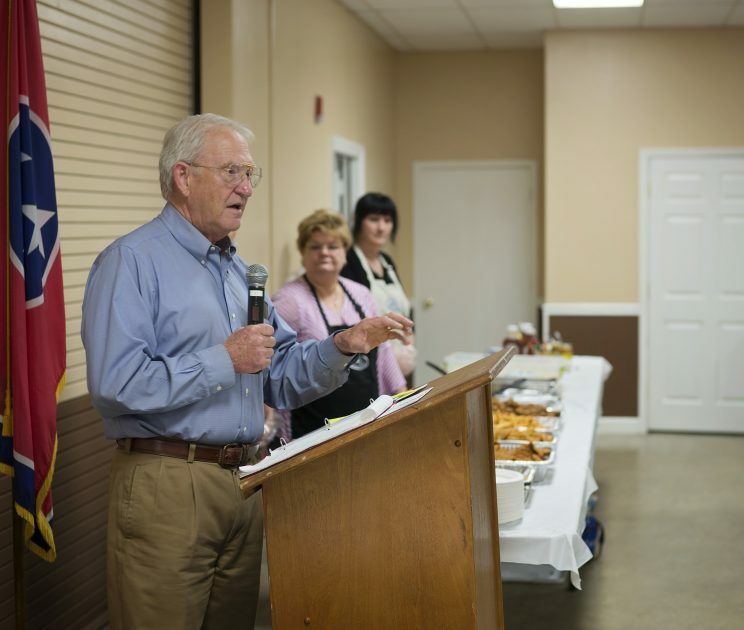 In October, Fellowship House held its 5th annual fundraising dinner at the fairgrounds. 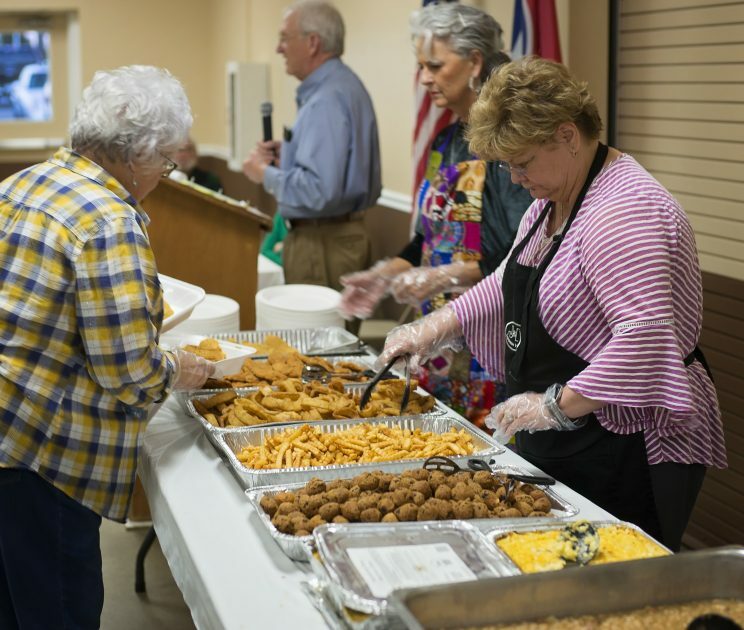 It was a catfish and chicken dinner and dedicated in the memory of Dr. Larry Locke, who was the founder of the dinner and former chairman of the board at Fellowship House. Denney said the outreach needs money to possibly expand, but will continue to focus on serving the community and provide a safe, structured environment for men who have nowhere else to go, outside of the streets and a life of addiction. Fellowship House is located at 206 South College Street in Lebanon.